¶ 1 Leave a comment on paragraph 1 0 Back in August 2013, as we were scrambling to post and polish up essays for the open peer review, I signed a book contract with our publisher, and just now realized that I never published it online, as Kristen Nawrotzki and did with a similar contract for our previous book two years earlier. Newcomers to academic publishing tell me that they appreciate reading sample contracts, though let’s be clear that our arrangement is not a typical one. We effectively decided to decline royalties (which never amounted to much anyways) in exchange for making our scholarship freely accessible on the web (which has far greater value to us and our growing community of readers). Furthermore, Michigan’s contract allows authors to retain copyright over our own work, while granting them the right to publish it under a Creative Commons license. Overall, it’s a win-win deal. ¶ 2 Leave a comment on paragraph 2 0 Click image to view Web Writing book contract PDF in a new tab/window. ¶ 3 Leave a comment on paragraph 3 0 As Michigan Publishing expands their newer open-access operations, they should fine-tune their book contract and clean up some of the older language that still appears. For the sake of future authors, I emailed our editor in August 2013 to point out items that deserve correction or clarification, and have copied key excerpts below. 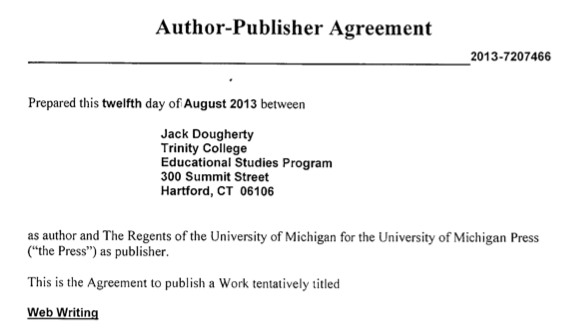 ¶ 4 Leave a comment on paragraph 4 0 Page 1 states that this agreement is with the University of Michigan Press, but I thought that Maize was an imprint of Michigan Publishing, not the Press. Perhaps I’m just confused about the difference between the two entities. Either one is fine with me. ¶ 5 Leave a comment on paragraph 5 0 Page 2, Section 4 (a) implies that I am the sole author of the work, but we both understand that I am the editor of the volume, and each contributor will sign an agreement to transfer publishing rights to the Press, as stated in Section 5 that immediately follows. ¶ 6 Leave a comment on paragraph 6 0 Page 2, Section 5 (a) states that distribution of the work under CC by-nc-nd licensing will not yield royalties, which is perfectly fine. But the contract suggests that only the electronic format will be licensed this way, while I believe that all of the print editions are distributed under the same CC license (see the copyright page), and perhaps your e-books, too. If so, then the bottom line remains the same — no royalties will be generated — but you may wish to clarify whether this applies to all CC-licensed works by the Press. ¶ 9 Leave a comment on paragraph 9 0 Page 5, Section 15(a) refers to the “author’s warranty (clause 2),” which should be section 4. ¶ 10 Leave a comment on paragraph 10 0 Page 5, Section 15(d) refers to “the date set out in clause 8,” which should be section 10. ¶ 11 Leave a comment on paragraph 11 0 Our editor at Michigan Publishing acknowledged that their standard contract needs revising, and for the long-term health of open-access scholarship, I hope that they have made progress.